As we know that the 18th century reforms was the first battle of India against the Britishers. After the revolts Britishers and others was reform Indian culture as well as society. For the 18th Century Revolts and Reform issues we are going to share some most important multiple choice questions i.e. 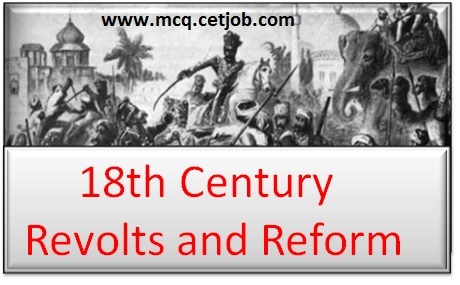 18th Century Revolts and Reform GK Questions for those students who want to prepare for the various exams like UPSC, PSc, SSC, Bank PO, TET, Vyapam, grade 1, preliminary exams etc. 1. Sathya Shodak Samaj also called truth seekers society was started by which of the following reformers? 3. Aravippuram movement which is considered as a precursor to all south Indian socio religious reform movement started in which of the following places? 5. Who among the following initiated reforms among Muslims? 6. Consider the following statement (s) related to the administrative causes of 1857 revolt. I. Deprivation of the traditional ruling classes of their luxury due to the establishment of the company's suzerainty over the Indian states; II. Introduction of new and revenue system which snatched the land from cultivator and gave it to the moneylender or traitor. III. Lord Canning's announcement to that Mughals would lose the title of King and be mere Princess. Which is/are correct statement(s)? 7. Which of the following is one of the social reasons for 1857 revolt? A) The English could not establish any social relationship with the Indians. D) The company’s trade policy destroyed Indian handicrafts. 8. Who was the prominent leader in Lucknow during the Revolt of 1857? 10. Consider the following statements related to the cause of 1857 revolt. I. It was a great disparity in salaries between the Indian and European soldiers. II. The Indian sepoys were treated with contempt by their European officers. III. The sepoys were sent to distant parts of the empire, but were not paid any extra allowance. Which is/are correct statements? 11. Who among the following British Officials suppressed the Revolt of Jhansi? 12. Who was the governor-general during the Revolt of 1857? 13. Sir Huge Rose described whom as ‘the best and bravest military leader of the rebel’? 14. Which of the following leader associated with Barout in Uttar Pradesh during 1857 revolts? 15. Who is the author of the book”The First Indian War of Independence- 1857-59”? 17. Aligarh Movement towards the end revented its followers from joining the national movement. Which of the following reasons made it to take this decision though it initially propagated for unity? 18. Which of the following is not correct about Prarthana Samaj? A) The Prarthana Samaj was founded in Bombay in1867. B) The Prarthana Samaj was founded by Athmaram panduranga (with the help of Keshav Chandra Sen). D) This society was against the widow remarriage. 19. Who was the founder of Satyashodhak Samaj? 20. Which of the following is not correct about Arya Samaj? A) The Arya Samajists opposed child marriages and encouraged remarriage of widows. B) It was founded in 1875. D) None of the above is correct. 21. Where was the Devdasi System prevailed in India? 22. Who founded the Sri Narayana Dharma Paripalana Yogam? 23. What was the original name of Dayananda Saraswati? 24. Which of the following statement is not correct? A) Veda Samaj was established in Madras in 1864. C) An outstanding leader of the reform movements in western India was Kandukuri Veeresalingam. D) Veda Samaj also condemned superstitions and rituals of orthodox Hinduism and propagated belief in one supreme God. 25. Who advocated the concept of one caste, one religion and one God’ for all? 26. Who is the author of the book “Satyarth Prakash”? 27. Where was Narayana Guru born? 28. What was the contribution of Sayyid Ahmad Khan towards education of Muslims? 29. Which of the following are the reasons for which Wahabi / Walliullah movement was started? 30. Titu mir’s movement considered one of the Muslim reform movement mainly aimed at eradicating which of the following systems? 31. Faraizi Movement which aimed at removing social reforms in muslims started in which of the following regions? 32. Wahabi movement aimed to organize Muslims around two fold ideas, which of the following forms the ideas among them? 33. Which of the following statements regarding Ahmadiya Movement is/are correct? 34. The Servants of Indian Society started by Gopal Krishna Gokhale was set up with which of the following objectives? 35. Which of the following statements regarding Gyana Prasarak Mandalis or student literary and scientific societies is / are correct? III. Aimed to start schools for girls. 36. Sri Narayana Guru Swamy initiated a programme of action called Sri Narayana Guru Dharma Paripalana yogam which took up issues regarding depressed classes, contains which of the issues? 37. Justice movement was started by? 39. Which of the means adopted under Self Respect Movement? D) Sanskrit lessons to be imparted only to Brahmin family members and others to be devoid of it in order to preserve its purity.